Does laser hair removal cause acne? Can at-home devices be just as effective as pro treatments? Can laser hair removal cause nerve damage? Can laser hair removal affect my skin tone? Does laser hair removal affect fertility or pregnancy? Is laser hair removal safe for all skin tones? Lasers are generally considered safe, but there are some noteworthy risks to consider before you book your procedure. Laser hair removal has evolved, and now there are treatments available for people of all skin types and tones. Like many hair removal options, laser treatments can cause discomfort and mild pain. Do you have unwanted facial or body hair? If so, you probably know about the benefits of laser hair removal — it’s precise, quick, and in some cases can lead to a permanent reduction in hair growth. But what about the risks and side effects? Here are the answers to all your laser hair removal concerns. Laser hair removal is generally considered safe, and medical lasers are approved for hair removal use by the U.S. Food and Drug Administration (FDA) in the United States. With that being said, hair removal laser machines do expose the body to radiation, which can cause cancer when the body is exposed in high levels for long periods of time. Luckily, the types of lasers used for hair removal are relatively safe compared with higher-risk X-rays and gamma rays. Hair-removal treatments use what the FDA calls “non-ionizing radiation,” meaning the laser does not pass through the body and cause damage to your cells. In other words, the light from a standard Nd:YAG or Alexandrite laser only acts superficially, making it unlikely that it will cause DNA damage or cell mutations. Most treatments for removing unwanted hair are painful to a certain degree. While many people describe the pain of waxing as a stinging, burning sensation, laser hair removal feels more like having a rubber band snapped on the skin over and over. Whether it’s more painful than waxing comes down to a person’s individual tolerance to pain and the specific area treated. The great part about laser hair removal compared to at-home waxing is that you’ll be treated by a skilled laser technician. He or she will use a numbing cream to help minimize pain and discomfort. This is especially useful in more sensitive areas, such as the bikini line. When you go under the laser for any sort of skin-perfecting technique, the last thing you want is to come away with more skincare issues. Since lasers are often used to eradicate the facial hair on sensitive skin around the upper lip, nose and brows, it’s only natural to be concerned about whether or not it will trigger or worsen acne. Some doctors report that people who have coarse hair are more likely to experience breakouts for a few days following laser skin treatments. To avoid this, make sure you talk to a professional about the types of lasers that are most appropriate for your skin. Incidentally, many laser brands claim that their technologies can actually clear acne. You’ve probably seen commercials for those strange-looking light therapy acne masks — some even claim that they can smooth bumpy skin and clear away ingrown hairs. Make sure to consult your dermatologist before investing in any of these products. One thing you need to know before trying any sort of laser hair removal treatment is that there’s a wide range of devices on the market. Home-use lasers can certainly bring desirable results, and they’re more affordable over the long-run, but they’re not the best for everyone. Professionals tend to use the Nd: YAG lasers or intense pulsed light (IPL), whereas at-home laser removal machines often use a diode laser or a non-ablative fractional laser. Diode lasers are super-effective, and are sometimes even more effective than Nd: YAG and IPL. In other words, home devices have the potential to be just as good of an option for some people. With that being said, the nature of laser light makes it somewhat more nuanced than, say, at-home hair color or waxing. Some skin tones respond better to certain lasers than others, which is why professional advice can be invaluable. Generally speaking, small areas can be effectively treated at home using a store-bought device. If you need to cover a larger area, you should probably see a professional. Your hair follicles are filled with fine nerve endings, which is why waxing and other hair removal techniques have a reputation for being painful. During any permanent procedure, the nerve endings are removed alongside the follicles. Although this seems a bit scary, it’s actually perfectly safe and is unlikely to cause any long-term adverse effects. The good news is that your hair is on the exterior of your body, and as we mentioned before, most cosmetic lasers are classified as non-ionizing, which means that they won’t penetrate very deep or potentially cause nerve damage. Again, the last thing you want to happen to you during or after laser therapy is worsened skin. Lasers are known to stimulate melanin production, which can cause a darkening effects. In some cases, the lasers work to suppress melanin production, which can cause the skin to lighten. This is one reason why laser toning is often recommended as a skin-lightening treatment. People with darker skin are more likely to experience laser burns, since darker pigments absorb light more easily. Luckily, this issue is temporary and usually resolves itself within just a few days. Laser treatments can also cause the skin to be more sensitive to the sun and UV damage, so wearing a good-quality sunscreen daily after treatment is vital. One of the most common misconceptions associated with laser hair removal is that it can cause infertility, especially when it’s used along the bikini area and other body parts associated with the reproductive system. Luckily, this is simply not true, and is downright impossible. Lasers only penetrate the skin at less than a millimeter, so they’re far away from your ovaries or reproductive organs! So what about pregnancy? In general, laser hair removal is considered safe during pregnancy, but most doctors and technicians caution against the procedure just to be extra-safe. The American Pregnancy Association recommends avoiding the treatment and other less-studied cosmetic procedures simply because there hasn’t been enough research into the possible effect on the fetus. For the best possible results, wait until after you’ve given birth to get rid of that stubborn hair growth! Your skin tone has a lot to do with which type of laser a professional will recommend. Some lasers are more effective on light skin, while others are best-suited for darker skin. However, things have evolved significantly in recent years, and new technologies have made it simpler to treat people with a range of different skin tones. In the past, African-Americans, Latinos, Asians and other ethnic groups were discouraged from seeking laser treatments because older lasers had a tendency to damage or lighten darker skin and cause irreversible pigmentation issues. With that being said, those who have dark hair and dark skin are more likely to have coarser hair growth, which can make laser hair removal more painful. A good specialist or technician will work with you to determine which specific type of laser is most appropriate for your skin color. Laser hair removal devices focus highly concentrated light at hair follicles. The hair absorbs the light, destroying the hair in the process. Over several sessions, the treatment can result in permanent hair loss, so you may never have to shave the area again. This promise is the siren call of laser removal, and the reason why it was the fourth most popular minimally invasive cosmetic procedure performed in 2016, according to the American Society of Plastic Surgeons (ASPS). Laser hair removal is certainly tempting — after all, who doesn’t want to throw out their razors and shaving cream and say goodbye to nicks and shaving rashes forever? But professional laser hair removal comes at a steep cost, literally: the treatment can rack up thousands of dollars over the course of several sessions before completely ridding an area of hair. As with any beauty trend, it was only a matter of time before at-home laser hair removal devices hit the market. Read on to learn how at-home laser hair removal works and who’s considered to be a good candidate for the treatment. Then we’ll break down the best consumer products for you to consider. As with many other cosmetic devices, the at-home versions aren’t exactly equivalent to professional machines when it comes to laser hair removal. Originally, at-home laser hair removal devices employed a diode laser or a non-ablative fractional laser, while professional machines used Nd: YAG lasers or intense pulsed light (IPL). 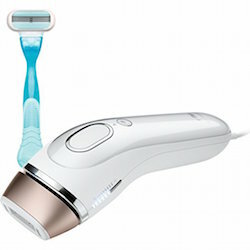 However, as the technology has progressed, some at-home IPL hair removal devices have entered the market. Depending on how powerful your at-home device is, you may require multiple treatments to achieve the desired results. However, the tradeoff is that at-home devices generally cost around $400 — which isn’t exactly cheap, but certainly more affordable than the several thousand dollars a full professional treatment regimen costs. Some skin tones respond differently to laser light, and the best candidates for at-home laser hair removal usually have high contrasts between their skin color and hair color. Low contrast — for example, light skin and light hair or dark skin and dark hair — may cause the skin to absorb the light along with the hair, causing burns or other unpleasant side effects. If you don’t have a lot of contrast between your skin and hair colors, you should consult a doctor before trying at-home laser hair removal, and may be wiser to look into professional treatments. Because of their smaller size, at-home laser hair removal devices are best used to treat small areas such as the underarms. If you’d like to remove hair from a larger area, such as your entire leg, you should probably see a professional. Now that you have a better idea about the pros and cons of at-home laser hair removal, let’s evaluate your options. Which are the best devices out there? 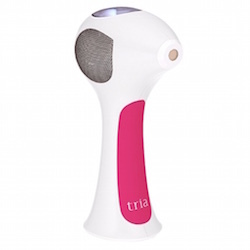 The Tria was the original at-home laser hair removal device to hit the market, and also the first to be approved by the FDA. It still hasn’t surrendered its spot as one of the most popular devices on the market — in fact, InStyle magazine named it the best hair removal product of 2017. The cheerful cordless design is a bit top heavy, but the base is flat so you can set it upright on the counter — something you can’t do with every other device. Depending on where you’re shopping, the Tria is available in different colors, including white with fuschia accents, white with green accents, and dark grey with light grey accents. The Tria has five intensity settings, and it’s suggested to start with a lower setting and work your way up as treatment progresses. Tria recommends using the device once every two weeks for three months to achieve optimal results, though you may need to do the occasional maintenance session after that time. The device features a skin sensor to tell when you’ve aligned it correctly, and also has a lock mechanism that will engage if the device isn’t properly lined up, keeping you from accidentally zapping yourself. The device uses diode lasers to target the hair follicle. The company also offers a companion product, Tria Beauty Hair Removal Laser Precision, which uses the same technology but is designed to target very small areas, such as the upper lip. The precision device is more portable and better for travel, as it only weighs about half of the original Tria’s 4 pounds. Not to be outdone, New York Magazine named this FDA-cleared product their best at-home hair removal product for 2017. Shaped almost like a large electric razor, the device features a curved, ergonomic handle that’s easy to manage, and the white-and-copper design won’t look out of place on your bathroom counter. The Silk-Expert from Braun uses intense pulsed lasers (IPL) to reduce hair growth in as little as four treatments over four weeks, and it delivers up to 300,000 laser pulses over the life of the product. Depending on the size of the treatment area, the Silk-Expert can treat smaller areas such as the lower legs, underarms, and upper lip for up to 35 years, or provide full body treatments for up to 15 years. According to Braun, the device can treat an arm or leg in as little as eight minutes without losing effectiveness. There are two settings: a “gliding” mode for treating larger areas, and a precision mode for treating smaller areas like the face. It also features two intensity settings, normal and gentle, the latter of which can be used for sensitive skin or maintenance treatments. The Silk-Expert features a skin tone sensor that assesses your skin tone 80 times per second and automatically adjusts the light intensity accordingly. Braun provides a skin tone and body hair comparison chart so you can determine if your skin-and-hair combination is a good candidate for the device. Included with the device is a Gillette razor to help you prepare the treatment area, as hair should be shaved before using the laser. However, you shouldn’t wax for at least a month before using this (or any) laser, as it removes the root of the hair. Remington is a household name when it comes to at-home beauty appliances, so it’s no wonder they branched into at-home laser hair removal devices. 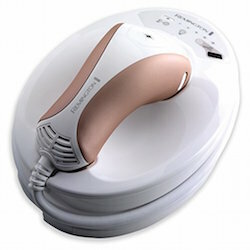 Like the Silk-Expert, the Remington iLIGHT uses IPL technology to permanently reduce or remove unwanted hair. Unlike the other designs covered here, the iLIGHT uses finite cartridges that run out of power after roughly 1,500 to 2,000 flashes. The product comes with several replacement cartridges, and you can buy extra packs if you’d like to continue treatment. The three colors offered by Remington indicate different models: copper (glass lamp, for use on the body below the neck), purple (quartz lamp, for use on the body below the neck), and teal (quartz lamp, for use on the face AND body). It’s important to note that the copper and purple models should not be used on the face, only the teal model. The device features both skin contact and skin color sensors for safety, and it’s corded, so it must be plugged in order to use it. It also offers five intensity levels so you can vary the treatment depending on which area you’re targeting. The product comes with a limited two-year warranty in case anything goes wrong. Whether it’s on your face or your body, unwanted hair can be inconvenient and even embarrassing for some. If you’d like to permanently reduce or remove facial or body hair and aren’t sure if you can afford to splurge on professional treatments, at-home laser hair removal can be a great option if your skin and hair make you a good candidate. The devices we’ve vetted here are an excellent place to start (or maybe end) your search for the perfect at-home laser hair removal device. If there’s not a lot of contrast between your skin and hair, or if you’d like to have hair removed from a more sensitive area like your bikini line, Zwivel.com can help you find a qualified cosmetic doctor in your area.